Villa Demetra offers panoramic views across the bay and beyond the Baths of Aphrodite, the Akamas Peninsula, Latsi, and also across the rolling countryside and hills. This villa is extremely spacious with a private good sized infinity edge swimming-pool, attractive terraces and balconies, and an excellent standard of accommodation inside, well-appointed rooms and attractive furnishings. This magnificent house is ideal for families, large groups of people or couples who are looking for a smart, stylish and deluxe villa in a quiet area offering high speed internet and stunning mountail and sea view. The villa is about 300 sqm. Whilst the lush colorful gardens of roses, orange and lemon, medlar, mandarin, avocado trees, laurels, jasmine and herbs diffuse their irresistible perfumes, be transported into the abyss of endless blue from your swimming pool overlooking the sea and beyond to where the horizon meets the sky. From the intimate atmosphere to the luxurious surroundings brimming with character and charm, the owners have thought of everything to make your stay unforgettable. The interior is spacious and fitted with all modern amenities to make your stay pleasant, comfortable, safe and pleasurable. 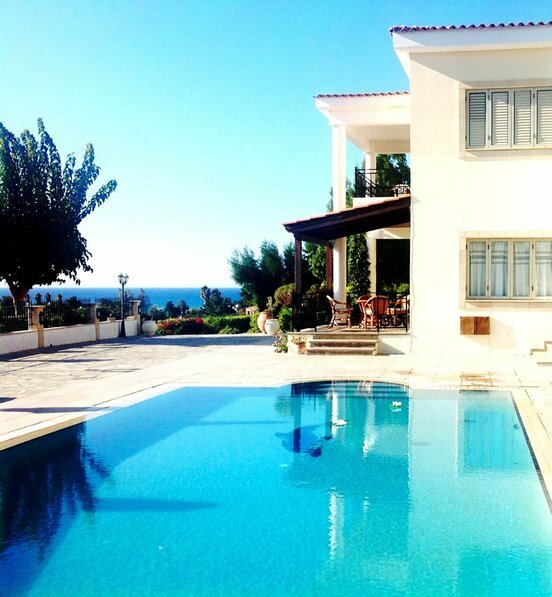 The villa provides an inviting swimming pool, located in the front of the villa next to the outside dinner area, as well as a barbecue spot with ample space for sunbathing, relaxing while you enjoy and admire Argaka's natural beauty. Argaka snuggles into the hills on the west coast of Cyprus. Set between Pomos and Latchi, it’s a slow-paced village with a couple of churches and winding streets that lead to a handful of shops, coffee bars and taverns. The unhurried vibe continues onto the sandy beach and up into the mountains, where walkers take relaxing strolls through the rural landscape. Set in the far south of the Mediterranean, Cyprus has one of the best climates in Europe. Blue skies come as standard, and the island sees a massive 340 days of sunshine a year. Swimsuit temperatures kick in as early as April, when the mercury rises into the low 20s. Things get much hotter in the summer – 30 degrees is normal, although don’t be surprised if the thermometer creeps closer to 40 on some days. Autumn is slightly cooler, so it’s perfect for sightseeing or hiking in the Mountains. Cyprus gets most of its rain between December and March, but it’s not much, and temperatures are still pretty mild. At Villa Demetra you can celebrate Christmas with your family or your friends in a quiet area, in a spacious house with all facilities. Argaka village is a beautiful place for a holiday villa as it is just a few minutes away from the beach and it has all that you need to make your stay pleasant. Argaka has a sandy beach with clear warm sea. From here, you're within easy reach of Latchi or Polis, both with sandy beaches and beach-side local fish taverns and high quality local restaurants. The visitors of the village are given the opportunity to enjoy the nature of Argaka by following the Nature Study Trail. While walking along the Trail, visitors can enjoy the beauty of the pine forest and the panoramic view towards the Community, the Chrysochous Bay and the Akamas Peninsula. If you prefer, you can enjoy a golf game at Tsada Golf Course, just 30km from the villa. There are lot of activities in Polis and Latchi ranging from water sports, swimming, helicopter ride, boat trips, fishing, go-karting, mini golf, night clubs, bars, nature walks, historical sites such as the Baths of Aphrodite, Bowling, Safari's, Sunbathing on the several natural beaches, Cycle routes and much more. The Argaka area is very fertile and has an abundance of fruit trees including figs, grapes, prickly pears, apples, oranges and lemons. Being rural, early morning walks are particularly enjoyable. Additionally, in Argaka one encounters several species of the Cypriot fauna and mainly black francolins, partridges and loggerhead turtles. Argaka has two churches, Ayia Varvara is the oldest one. It also has a few coffee shops, bars, hairdressers and tavernas which serve excellent local food. Besides, if you want to find more shops, banks, restaurants, night clubs and pharmacy, Polis is only a short drive away, about 5km and Latsi about 8km away. Villa Demetra is located in a very quiet area, suitable for the absolute relaxing and chill-out moments, but only some minutes from very interesting bars, cafe and restaurants, as well as cosmopolitan beaches. In a walking distance of about 1-2km you can find "Fly Again Irish Pub and Restaurant", "Argakiko" that is local tavern with souvlaki, sheftalia, pork chops and other local dishes, "Dimitris" tavern, "Saint Barbara", "The Half way House" and "Liza's place" cafe and Tavern as well as a bakery and mini market. All of them is beach front and has an awesome view. Ground floor: Large kitchen with utility room and dining area. Terrace leading to barbecue. The Living room leads out to pool terrace. Sitting room/den with sea-facing balcony, which can serve as a game room. Double bedroom with en suite shower room. Sweeping staircase leading to first floor with landing sitting area: Master double bedroom with en suite bathroom and dressing area. Twin bedroom with en suite shower room. Further twin bedroom with en suite bathroom. Outside, the courtyard features the swimming pool, space for car (s), a covered seating area, sun loungers and BBQ. Villa Demetra is situated near to Villa Niki, making them an ideal choice for two families or larger groups holidaying together. If you would like to rent VILLA DEMETRA for less than 5 nights during the summer time, you should contact us directly for more info and for code as the price is different. Also if you are interested in renting car, you can ask us and we will send you an offer. The owner of the agency will come to pick you up from Paphos or Larnaca airport. In addition if you are interested in safari to Akamas or Troodos or diving excursions or fishing trips or boat trips we can arrange and book seats for you at the best price. For you who want an exploration in Cyprus and you need an aware driver, we have the right driver for you as well! All balconies and patios have view in south, north, west and east. You can see this in the fotos.Also towels for the swimming pool, safety deposit box, hairdryer, wood for fire place for Winter onths,cleaning services once a week and Wi-Fi is provided and is included in the rental rate.